The Show That Never Ends is the definitive story of the extraordinary rise and fall of progressive (“prog”) rock. Epitomized by such classic, chart-topping bands as Yes, Genesis, Pink Floyd, Jethro Tull, and Emerson Lake & Palmer, along with such successors as Rush, Marillion, Asia, Styx, and Porcupine Tree, prog sold hundreds of millions of records. It brought into the mainstream concept albums, spaced-out cover art, crazy time signatures, multitrack recording, and stagecraft so bombastic it was spoofed in the classic movie This Is Spinal Tap. With a vast knowledge of what Rolling Stone has called “the deliciously decadent genre that the punks failed to kill,” access to key people who made the music, and the passion of a true enthusiast, Washington Post national reporter David Weigel tells the story of prog in all its pomp, creativity, and excess. Weigel explains exactly what was “progressive” about prog rock and how its complexity and experimentalism arose from such precursors as the Beach Boys’ Pet Sounds and the Beatles’ Sgt. Pepper. He traces prog’s popularity from the massive success of Procol Harum’s “Whiter Shade of Pale” and the Moody Blues’ “Nights in White Satin” in 1967. He reveals how prog’s best-selling, epochal albums were made, including The Dark Side of the Moon, Thick as a Brick, and Tubular Bells. And he explores the rise of new instruments into the prog mix, such as the synthesizer, flute, mellotron, and—famously—the double-neck guitar. 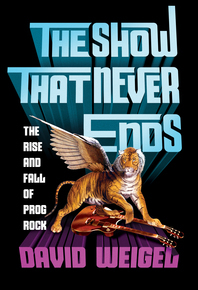 The Show That Never Ends is filled with the candid reminiscences of prog’s celebrated musicians. It also features memorable portraits of the vital contributions of producers, empresarios, and technicians such as Richard Branson, Brian Eno, Ahmet Ertegun, and Bob Moog. Ultimately, Weigel defends prog from the enormous derision it has received for a generation, and he reveals the new critical respect and popularity it has achieved in its contemporary resurgence.